An innovative, groundbreaking book that will captivate readers of Malcolm Gladwell, Daniel Pink, The Power of Habit, and Quiet For generations, we have focused on the individual drivers of success: passion, hard work, talent, and luck. But today, success is increasingly dependent on how we interact with others. 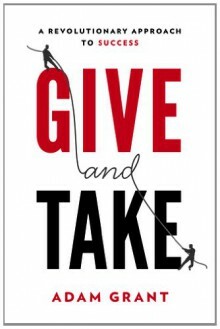 It turns out that at work, most people operate as either takers, matchers, or givers. Whereas takers strive to get as much as possible from others and matchers aim to trade evenly, givers are the rare breed of people who contribute to others without expecting anything in return. Using his own pioneering research as Wharton's youngest tenured professor, Grant shows that these styles have a surprising impact on success. Although some givers get exploited and burn out, the rest achieve extraordinary results across a wide range of industries. Combining cutting-edge evidence with captivating stories, this landmark book shows how one of America's best networkers developed his connections, why the creative genius behind one of the most popular shows in television history toiled for years in anonymity, how a basketball executive responsible for multiple draft busts transformed his franchise into a winner, and how we could have anticipated Enron's demise four years before the company collapsed-without ever looking at a single number. Praised by bestselling authors such as Dan Pink, Tony Hsieh, Dan Ariely, Susan Cain, Dan Gilbert, Gretchen Rubin, Bob Sutton, David Allen, Robert Cialdini, and Seth Godin-as well as senior leaders from Google, McKinsey, Merck, Estee Lauder, Nike, and NASA-Give and Take highlights what effective networking, collaboration, influence, negotiation, and leadership skills have in common. This landmark book opens up an approach to success that has the power to transform not just individuals and groups, but entire organizations and communities. There are givers. There are takers. Who loses? Who wins?As you might suspect, the givers lose. But here’s a surprise: the givers also win.Lots and lots here for those who own companies or manage people or just want to know more about human nature.